Today, we chat with Becky Malinsky, Primate Biologist at the Smithsonian’s National Zoo in Washington, D.C. about her career as a primate keeper, and what it’s like to work with lemurs and other primates every day at the zoo. Can you tell us about your background and how you got started working at the National Zoo? Becky Malinsky with two ring-tailed lemurs at the Smithsonian National Zoo in Washington, D.C. I received my undergraduate degree in Anthropology from American University, but my passion for primates goes back as far as I can remember. I blame my mother for giving me the nickname “monkey” when I was a little girl!! 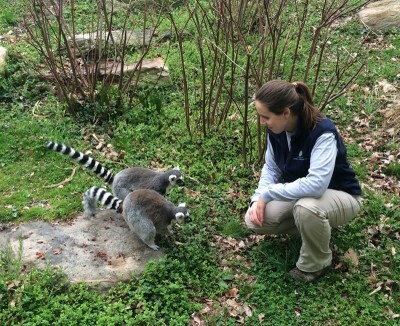 I always knew that I wanted to work with primates in some capacity, but it wasn’t until I started volunteering at the Smithsonian’s National Zoo, first as a docent and then as a keeper aide, that I realized my calling was to care for them in a zoo setting. I volunteered at the National Zoo for five years, was a Primate Keeper for nine, and have now been the Primate Biologist for about a year. A Biologist at the National Zoo is a position similar to a manager or assistant curator at another zoo. 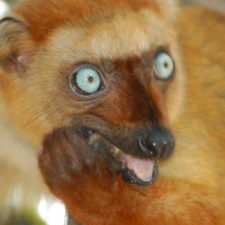 How did you first get interested in working with lemurs and conservation? Once I became a Primate Keeper at the Smithsonian’s National Zoo, and had the opportunity to work with a variety of lemur species, I quickly gained an affinity for them. Their cuteness-factor is a given draw, but they also possess so many characteristics that are unique in the animal kingdom. I found that my interest in lemurs grew each time I taught volunteers about their social organization or spoke with visitors about their various forms of communication. 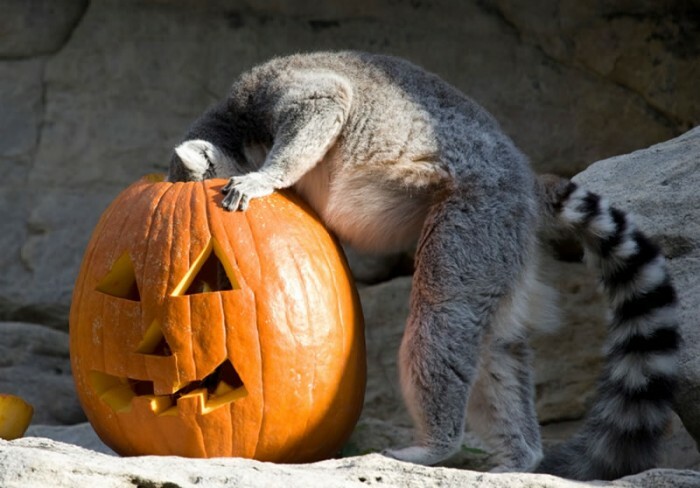 Naturally, my interest in lemur conservation and protecting their wild counterparts developed as well. 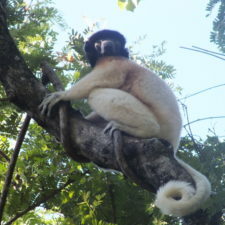 What projects are you currently working on that relate to lemur conservation? One way that I contribute to lemur conservation is through my role as a Steering Committee member on the Prosimian Taxon Advisory Group (TAG). TAGs are groups formed by the Association of Zoos and Aquariums (AZA), created to examine the conservation needs of an entire taxa, and to develop recommendations for population management and conservation based upon the needs of the species and AZA-accredited institutions. TAGs develop action plans that identify goals, scientific investigations, and conservation initiatives needed to best serve ex situ and in situ populations. Some examples include animal health, contraception, genetics, genome resource banking, conservation, nutrition, assisted reproduction, and education. One specific goal of the Prosimian TAG is to work diligently to educate the public that the personal possession of primates has significant negative implications for animal welfare, health, and safety. 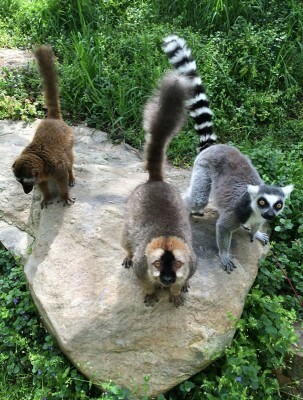 What are your favorite things about working with lemurs in a zoo? 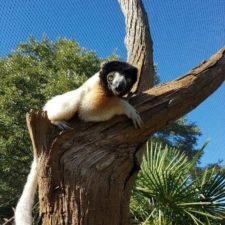 One thing that makes working with lemurs in a zoo very different than studying them in the wild is the opportunity to provide them with environmental enrichment opportunities. Environmental enrichment is the process of providing stimulating environments for zoo animals in order for them to demonstrate their species-typical behavior, to allow them exercise control or choice over their environment, and to enhance their well-being. Enrichment includes the design of stimulating and naturalistic enclosures, the housing of appropriate social groups in zoos, and the introduction of objects, sounds, smells or other stimuli in the animal’s environment. Environmental enrichment is just as critical to zoo animal welfare as nutrition and veterinary medicine. At the Smithsonian’s National Zoo, enrichment is an integral part of the daily care of the species in our collection. The short answer is that there is no typical day! On any given day, I could be working with one or all of the following primate species at the National Zoo: western lowland gorillas, orangutans, siamangs, white-cheeked gibbons, Allen’s swamp monkeys, Schmidt’s red-tailed monkeys, red-fronted lemurs, ring-tailed lemurs, and black-and-white ruffed lemurs. Knowing the social dynamics, individual personalities, and nutritional and environmental needs for all these animals can be challenging, but is vital to providing the best possible welfare for these amazing species ambassadors. Just a few of the responsibilities that I may undertake in a day are: cleaning enclosures, preparing enrichment, giving an educational talk to visitors, engaging an animal in a training session to help assess their health, working with other institutions to transfer animals to maintain genetic diversity, preparing a birth plan to ensure the best outcome for a newborn, updating keeper safety protocols, or working with our veterinary team to treat an animal with an injury. 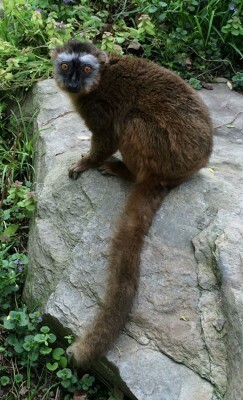 What are the hardest parts about doing lemur-related work in a zoo? The most difficult part of my job is having to say goodbye to an animal who I have cared for. I have known several of the lemurs at the National Zoo for 15 years and it never gets easier to lose a friend when their time comes to an end. 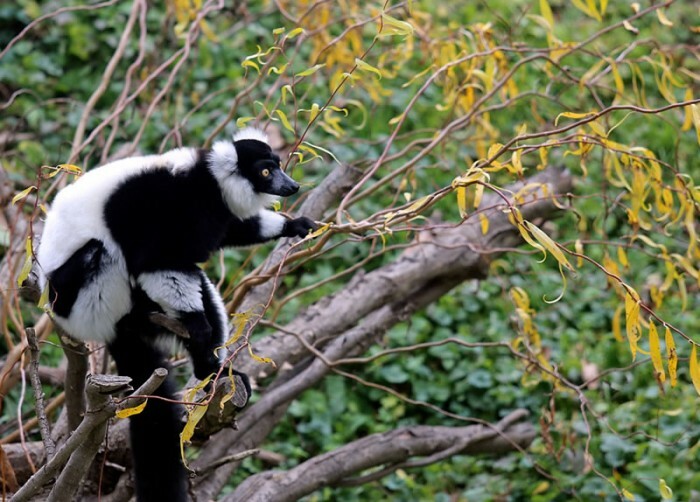 What are the biggest threats facing lemurs? 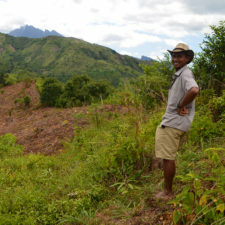 Habitat destruction is by far the largest threat to lemurs in Madagascar. As a zoo professional, it is often difficult to empower visitors to feel as though they can make a difference to wild lemur populations half-way across the world. I make every effort to educate guests through keeper talks and presentations to the plight of these magnificent animals. 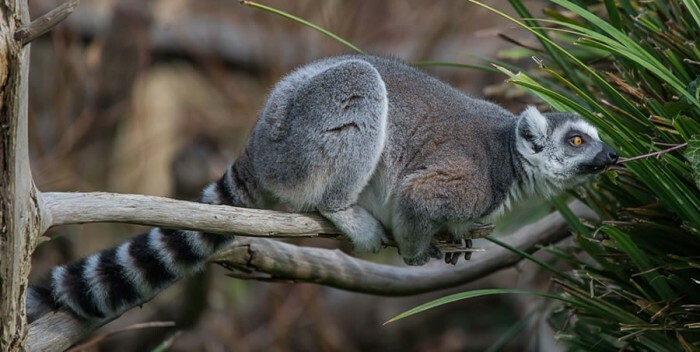 I firmly believe that when visitors can watch a lemur in front of them leap from branch to branch, that their interest in saving lemur habitat sky rockets. What do you hope to accomplish in ten years? In ten years, I hope to still be working in in the zoo field, inspiring the next generation to conserve not only lemur habitat in Madagascar, but to work towards saving all species! 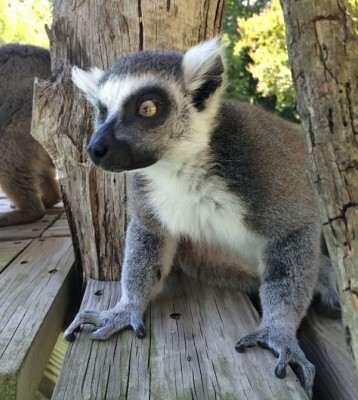 Visit your local zoo to learn more about their lemurs and support their conservation efforts.